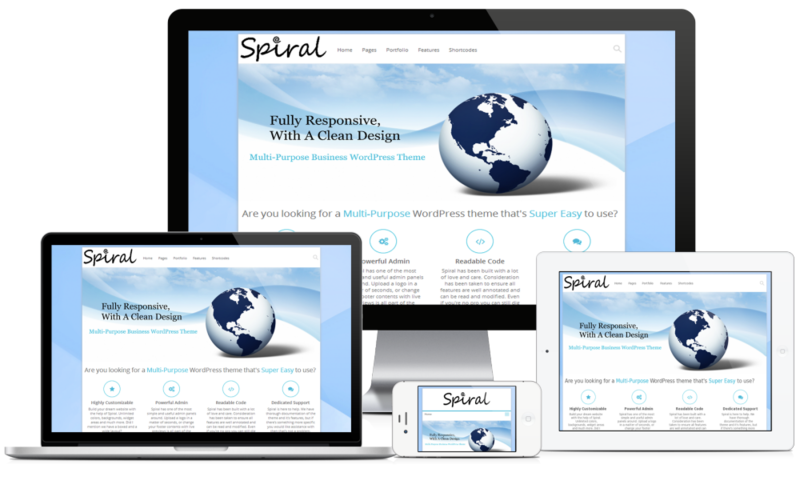 Spiral is a clean, ultra responsive and fully customizable WordPress Theme! Spiral is very intuitive to use and completely ready to operate out of the box. Built with HTML5 & CSS3, a lot of thought and care went into making the theme look professional whilst ensuring the customization options are a breeze to use. The clean design can be used for any type of website, whether it be business, coporate, blog, products, or users who simply want to showcase their work on an easy-to-use, modern theme. Fully responsive (resize your browser and see for yourself), retina ready, easy-to-use advanced admin panel, font awesome integration, four header designs, unlimited colors, amazing shortcodes, WPML and RTL ready, super easy installation and setup, choose from boxed and wide mode, custom widgets, and even WooCommerce integration! How can I change the width of the Boxed Version? 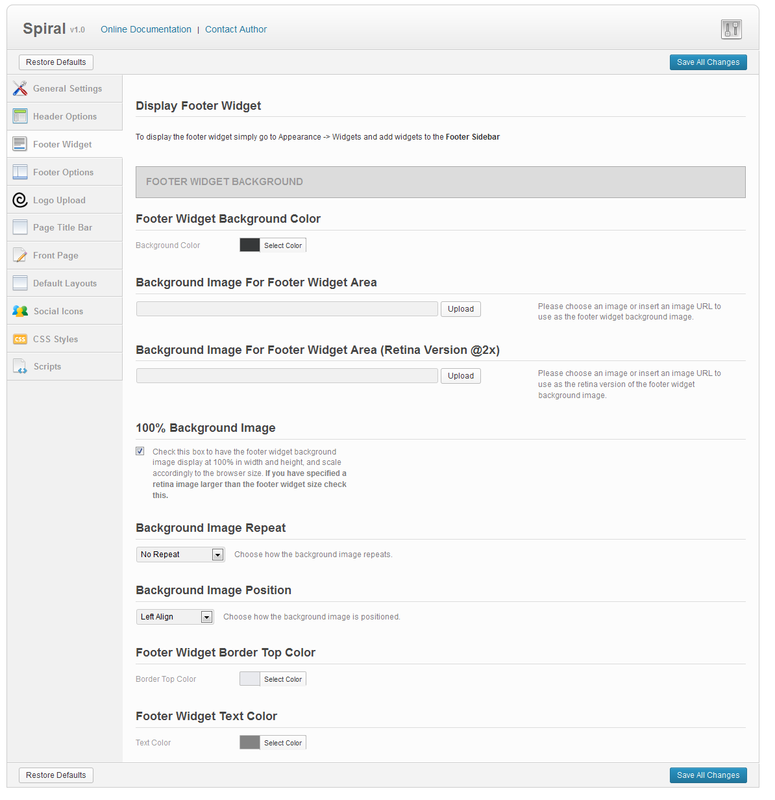 With Spiral update version 1.1, we have added an easy to use slider in our admin panel that allows you to adjust the width of the boxed version. Simply go to Admin Panel -> General Settings, and the top option is 'Boxed Version Width'. Because of Spirals fluid design, changing this option causes all of the content to readjust to the new boxed width perfectly. 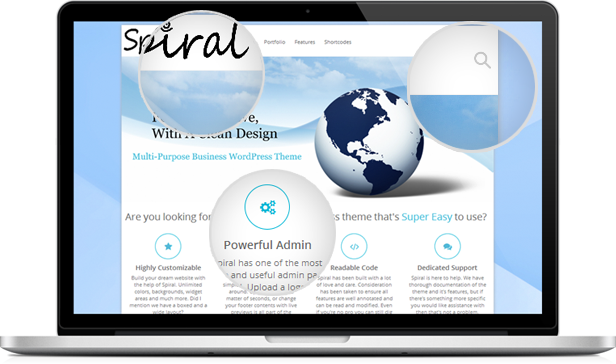 - We have hugely improved the blogging aspect of Spiral. With three new blog post layouts to choose from, including a very stylish Grid Layout option. Each layout give you the option for a CSS3 image rollover effect, which you can also customize the gradient colors via the admin panel. Happy Blogging! - The single post page has also had a huge uplift, with new pagination, social sharing box and general layout redesign. - Redesigned tags, categories, archive pages. They by default inherit the grid medium design, and look much better than before. 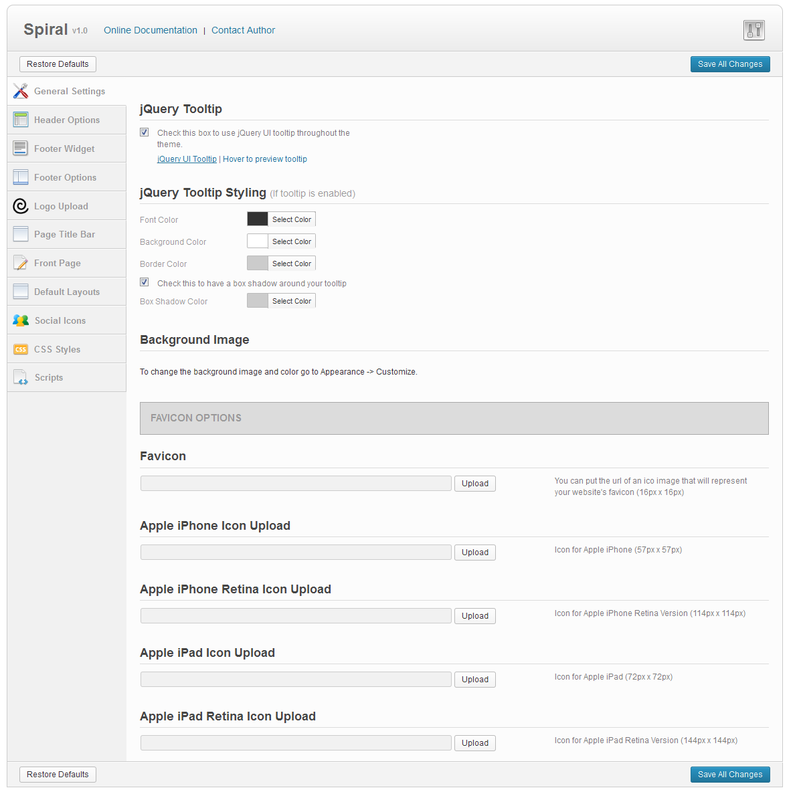 - Spiral\'s admin panel has three new sections; Social Sharing Box, Blog Options and Lightbox Options. 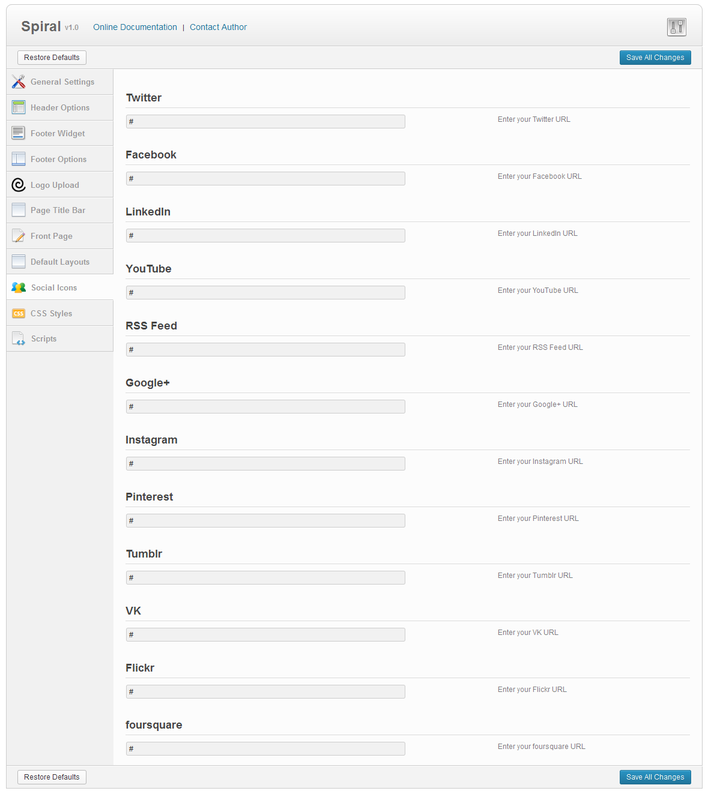 Social Sharing Box - Customize everything from the box colors, share box title, and which sharing links appear. 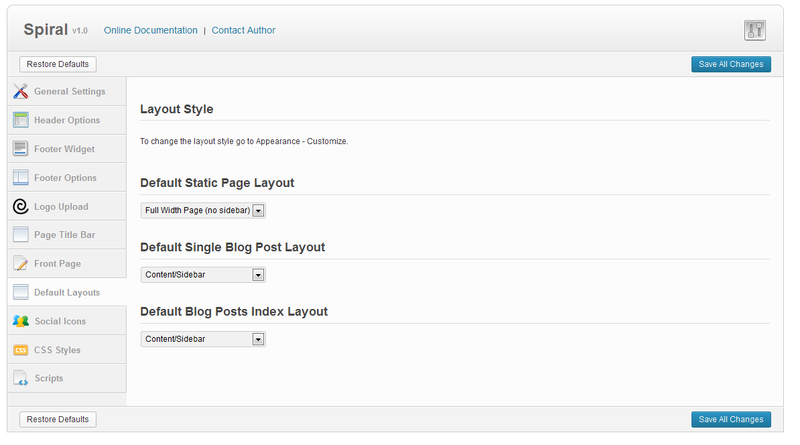 Blog Options - This section controls everthing to do with blogging and single post page options. 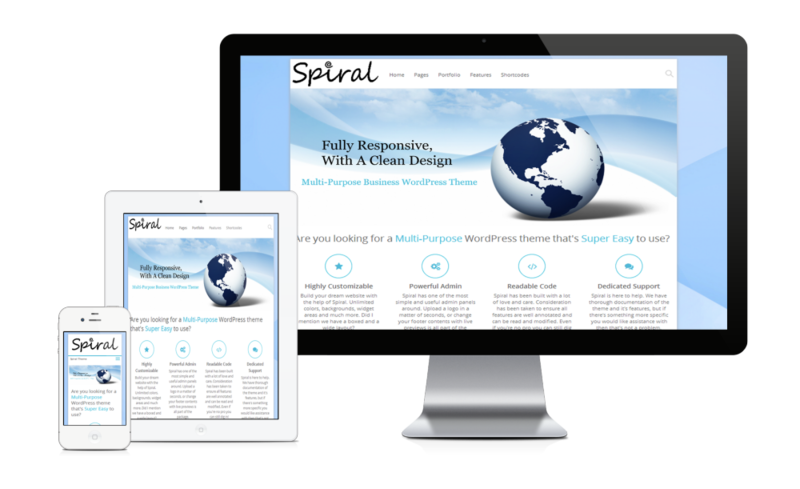 Packed with over 30 different customization options, you can create the perfect blogging site with Spiral. Lightbox Options - The jQuery lightbox was installed by default into prior version of Spiral, with standard settings. 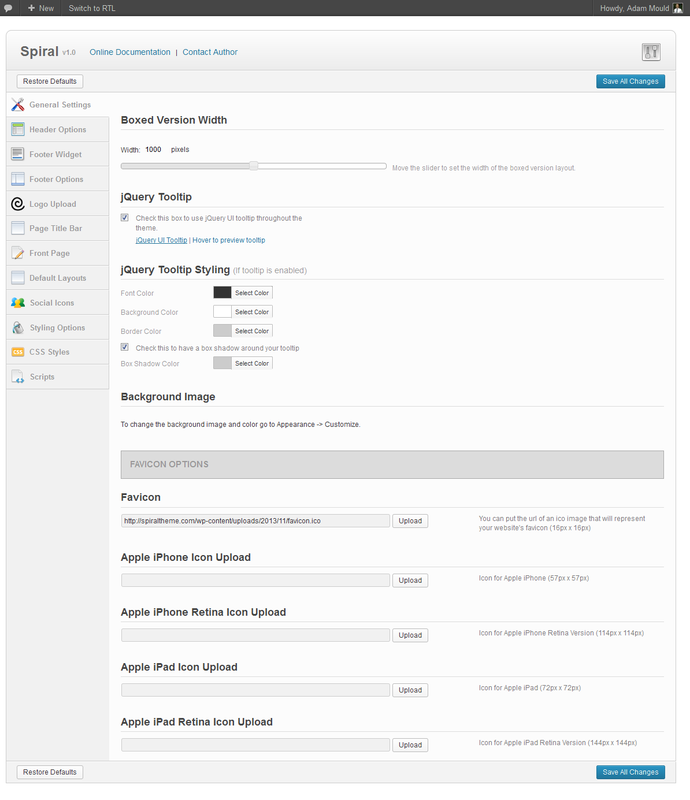 We have now devoted an entire admin panel section to fine tuning the lightbox, and how it displays. 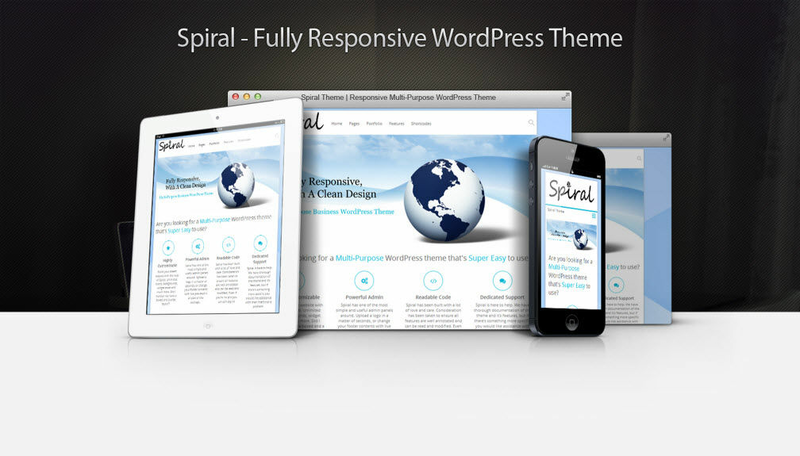 - Spiral now comes with 8 predefined color schemes, each with their own custom background. 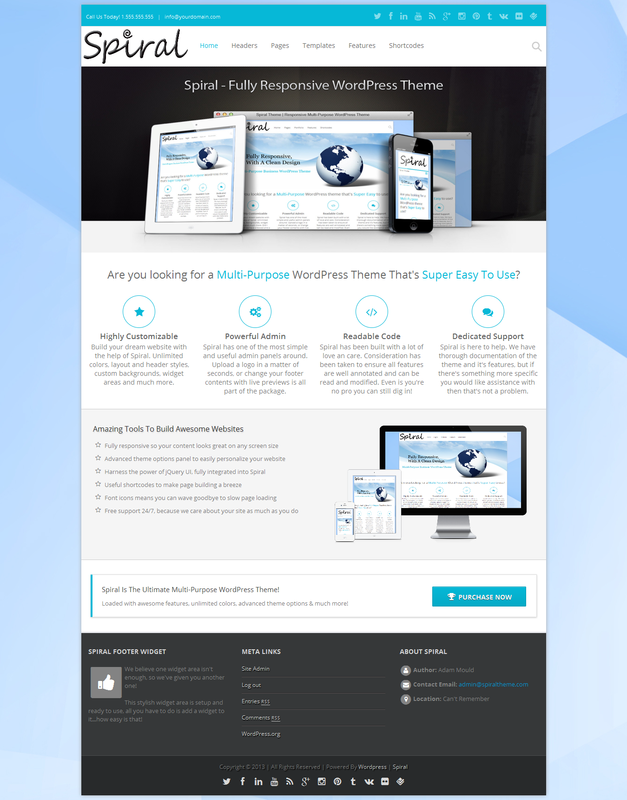 They can be fully customized as well, so you can adjust the color scheme to suit your site. Check out the live preview site, and in particular http://spiraltheme.com/color-schemes. 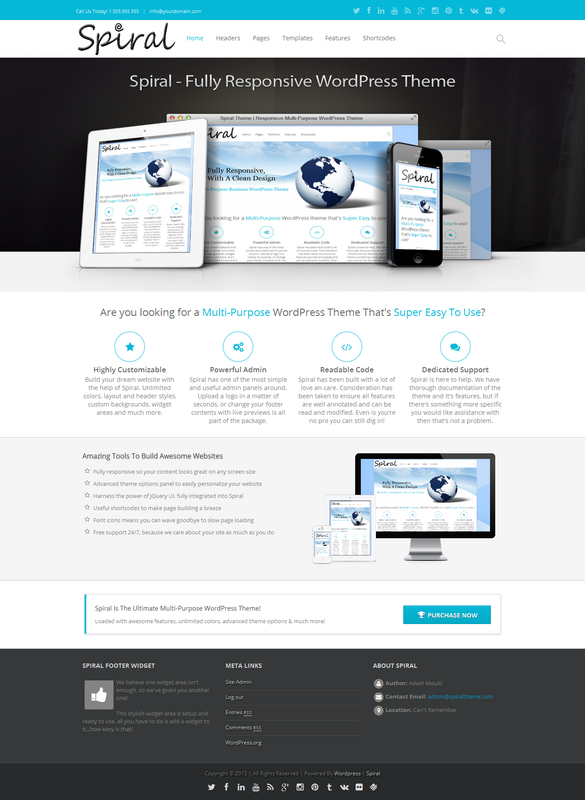 - We have made the theme a lot more user friendly. 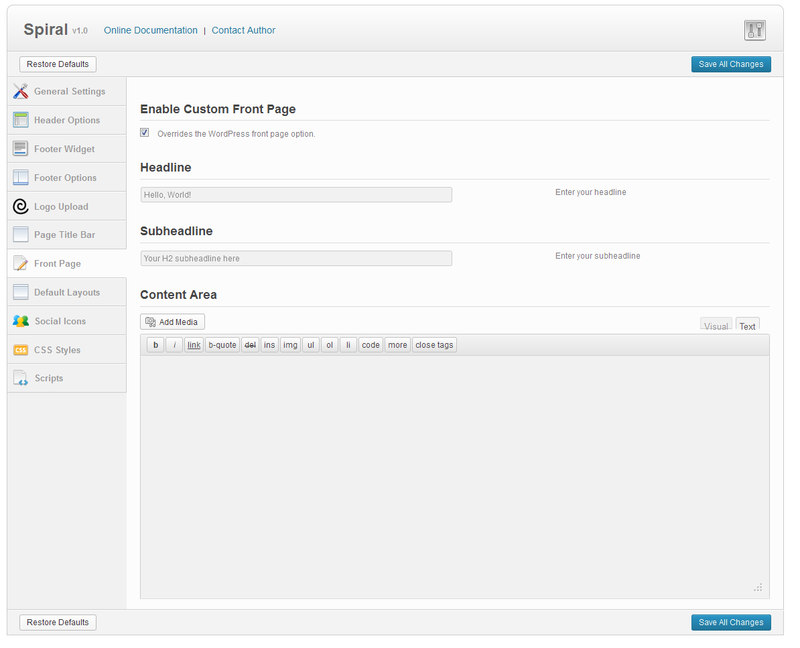 All of our shortcodes are now built in to the WordPress visual editor, and can be fully customized from the editor. Check out http://spiraltheme.com/shortcode-tinymce/ to see how useful they are. - A brand new Typography Options section to our awesome admin panel! Choose from 700 different fonts styles, including 650 Google Fonts! You can also specify font sizes and line heights for loads of elements throughout the theme. 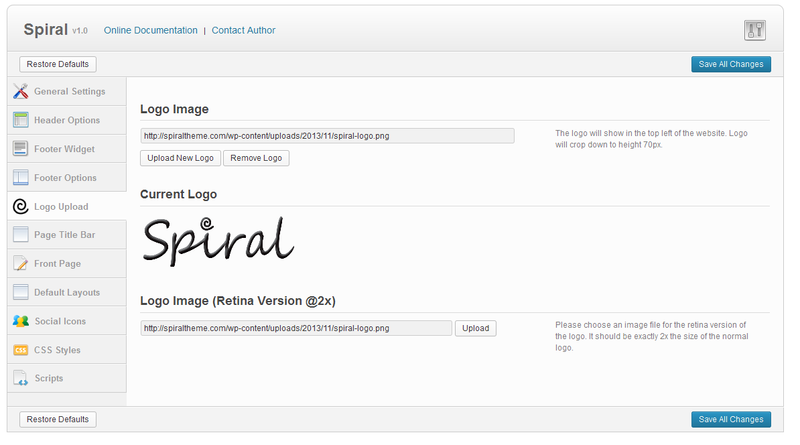 Check out the live preview site and in particular http://spiraltheme.com/advanced-admin-panel/font-options. 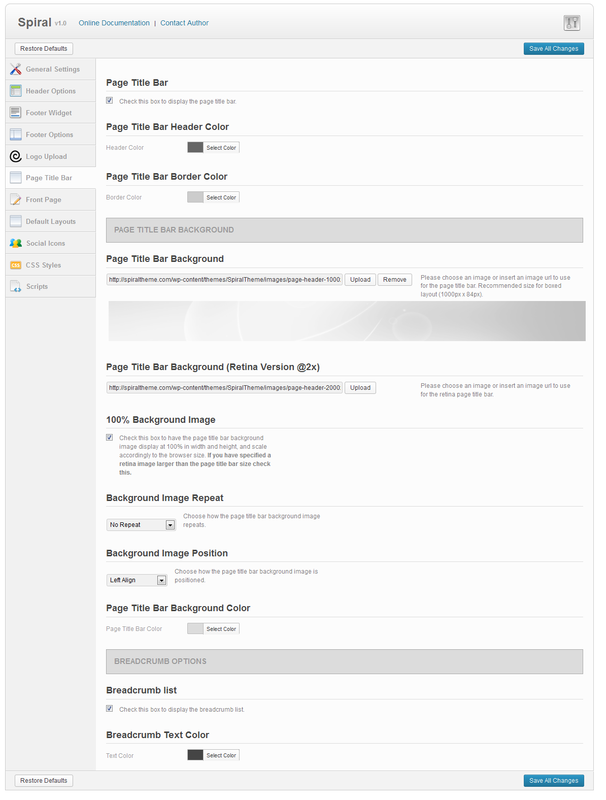 - New Styling Options for you to customize, along with the already mentioned color schemes. - The admin panel has become more user friendly. Upon disabling/enabling features in the panel, the related options will hide/show to save you viewing options you don\'t require. - A new updated and improved demo data XML file. You now have the entire SpiralTheme.com preview site to get you started! - The demo site has had a major uplift, to help you understand features and customization options. - Two new fantastic shortcodes for you to use! - - Content Boxes: Create amazing content boxes throughout your site with this highly customizable shortcode. Check out http://spiraltheme.com/content-boxes to see how awesome they are. - - Dividers: Five dividers to choose from, ideal for breaking up content and drawing the readers attention to the next section. Check our http://spiraltheme.com/dividers to see how easy they are to use. 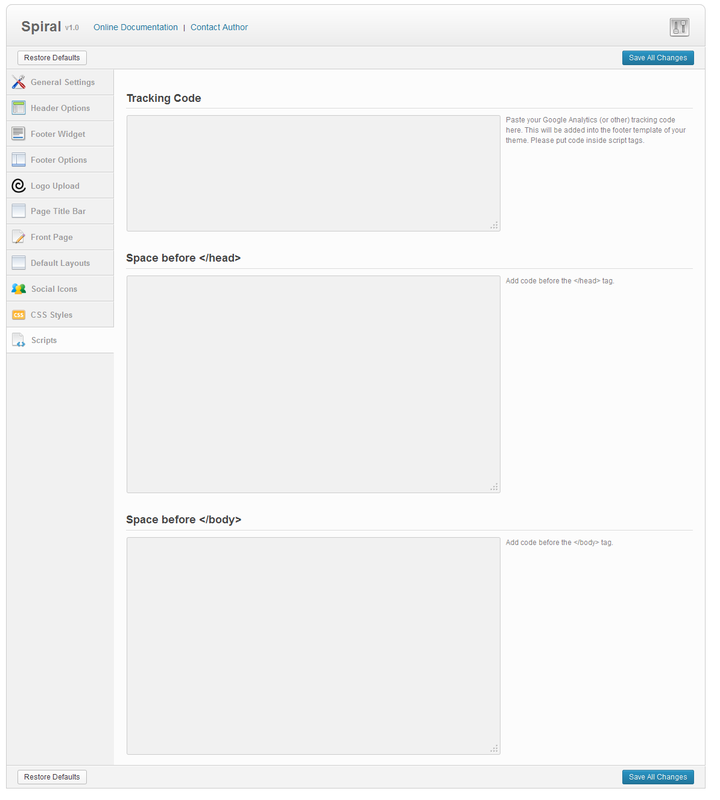 - Spirals advanced admin panel just keeps getting bigger. Styling Options has a whole bunch of new features including predefined color schemes that allow you to quickly change the entire skin of your theme. 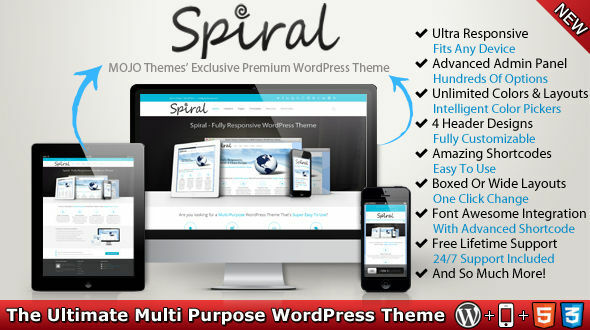 - SpiralTheme.com has new pages, and a style selector which allows you to preview a few features Spiral has to offer! - Fixed an error with the full width shortcode. -WPML updated to includes all new features. - Spiral is now even faster! By compressing files and code that do not need editing/reading, page load times have hugely improved. - Spirals advanced admin panel has just got even better! With a new Styling Options section, you can style every shortcode Spiral has to offer. There is also a whole bunch of new features, including a slider feature to specify the boxed version width, and shadow properties. - Added animated circles and counter boxes! These animated shortcodes are fully customizable and they look great! - Improved RTL support (rtl.css) has been updated. - Added demo data, so you can get up and running even quicker. - Fixed some minor styling issues.